BREAKING into export markets can be a daunting prospect for SMEs. 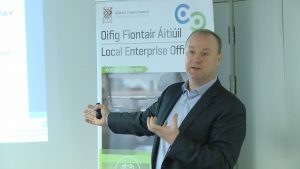 Kildare County Council’s Local Enterprise Office and the County Kildare Chamber of Commerce are keen to prove to Kildare business owners that it can be easier than expected. On Tuesday 2 April, the Local Enterprise Office, in collaboration with the Kildare Chamber of Commerce welcomed over 50 clients to the Osprey Hotel for ‘Exporting Success’ – a global exporting seminar for those with ambitions to expand into overseas markets. Jacqui McNabb, Head of Enterprise at Kildare County Council opened the seminar, highlighting the supports offered by the Local Enterprise Office in overcoming challenges posed by Brexit, and in facilitating global exporting. Technical Assistance for Micro Exporters (TAME) grants can part-fund the costs incurred in investigating and researching export markets, while Trading Online Vouchers (TOVs) can support small Irish businesses in enhancing their online trading presence. Attendees were joined by guest speakers Kilian Duignan, Director of Gateway Consulting, and JP Kalmeijer, co-founder of Cognegy. Expert in maximising sales through exports, Kilian Duignan of Gateway Consulting shared an overview of the potential risk areas and provided strategies for operating in a no deal Brexit environment. He highlighted the financial and advisory supports available to Kildare SMEs from Enterprise Ireland, Local Enterprise Office Kildare and Intertrade Ireland in this time of economic uncertainty. JP Kalmeijer of Cognegy specialises in strategy centric growth and profitability for US markets. His expertise and experience lies in the field of Strategic Business Development, internationalization, encompassing sales, marketing, finance and logistics. JP gave insight into the geographic, cultural and legal differences in doing business with the EU and the USA, and spoke about the opportunities available to Irish SMEs in the USA. Alan Shine, CEO Kildare Chamber of Commerce, announced details about upcoming trade missions. Kildare Chamber of Commerce and Local Enterprise Office Kildare will be travelling to Scotland this week for a trade mission to assess the dynamics of doing business with the UK post Brexit. There is also a trade mission to Boston planned to take place next month. Established businesses looking to expand their offering into the US are invited and are welcome to submit an expression of interest to either the County Kildare Chamber or the Local Enterprise Office Kildare. Spending only 3 days in Ireland JP Kalmeijer offered a number of 1-1 mentoring sessions to assess export readiness for Local Enterprise Office Kildare clients. If you have concerns about how Brexit will affect your business, our SME Brexit Scorecard will help you assess your organisation’s readiness for change in this potential new business landscape. Log on to https://www.prepareforbrexit.com to take the first step toward preparing for Brexit.